Accommodation is spread across multiple levels under angled, overlapping roofs in each of the seven spacious two-bedroom villas at The Layar. The open living and dining space sweeps from the edge of the pool across to the large, partly recessed kitchen and, via open-tread stairs, up to the mezzanine media room. Oriented for quiet seclusion, the master and guest bedroom suites are on separate sides of this vast living area, their ensuite bathrooms facing small private gardens. Each villa occupies up to 600sqm of well-screened grounds featuring a Bengkirai-wood sun deck with jacuzzi fronting a large curved pool. 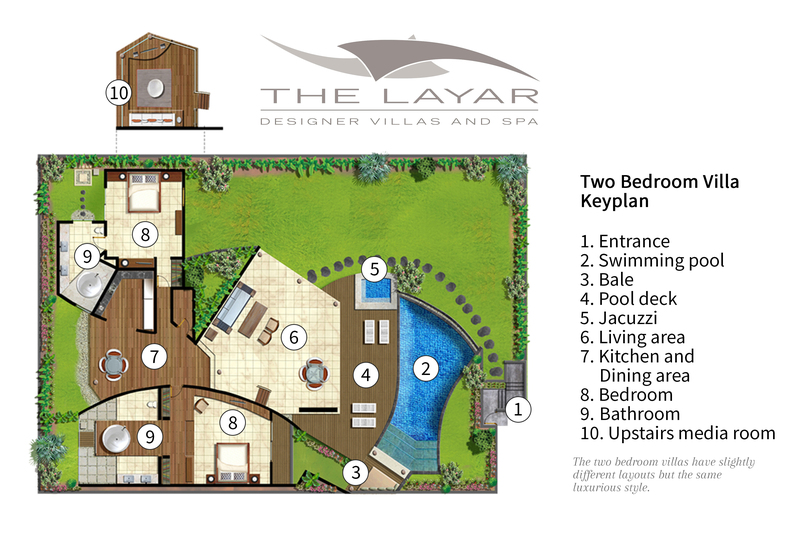 At the heart of The Layar’s two-bedroom villas is the two-tiered, light-flooded living area, individually defined by angled roofs and curved walls. Handsome sofas, chairs and dining tables cluster on the acid-washed marble floors that flow unrestricted from the pool edge to a verdant courtyard overlooked by the open-plan and very well-equipped kitchen with a bar counter. The mezzanine media room appears to float above the living area, its curved bank of built-in seating gazing towards the pool.